Few things are more exciting (or hectic) than the weeks and days leading up to a brand new product launch. I know because I’ve been through multiple product launches at Buffer. They’re fun, they’re wild and they all boil down to the same straightforward purpose: how can we drive attention and usage to a newly built feature. We’re trying to answer the age-old question: If a tree (product) falls (launches) in a forest and no one is around to hear it, does it make a sound? And in the course of spreading the word, we often find ourselves butting up against another challenge: What makes the product worth a consumer’s attention, especially when the consumer is deciding between you and someone else? All too often, businesses and startups treat social media as an afterthought. For us, our product launch advantage has been social media. With social media you don’t have to have thousands of website visitors, a huge following, a relationship with the editors at TechCrunch, or even an email list in order to get your product in front of your target audience. What other marketing channel can you say that for? All too often, businesses and startups treat social media as an afterthought, particularly when it comes to product launches. They may be posting to a few networks because they feel like they “have to” or that they “might as well”. Without a clear strategy in place, they are missing out on a huge opportunity. 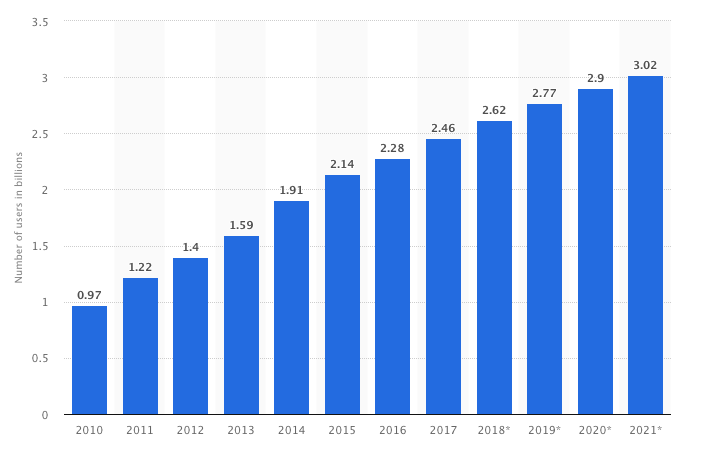 With more than 2.3 billion people around the world actively using social media to connect with family, friends and brands, it is currently the best solution for businesses looking to maximize their product launch results. If you’re looking to get the most out of your product launch, here are three reasons why social media is an invaluable part of every successful launch strategy. Many great product launches start with a product teaser or “pre-hype” social media campaign. Teasers help to build hype around your product and, when done right, can help grow your distribution list before the product ever goes live. This is particularly important if you’re a small business or startup with little-to-no brand or product recognition. Generating excitement around your product, via a product teaser, is a crucial first step. InVision recently released a glimpse of their new product, Studio, and it was one of the best designed product hype campaigns I’ve seen. All done on social media. Here’s how they did it. https://www.facebook.com/invisionapp/posts/849417495214804Notice how they used the words “elevate”, “powerful” and “design the future – together” to spark curiosity. That, coupled that with the eye-catching, sleek product imagery was enough to get people talking on social media. 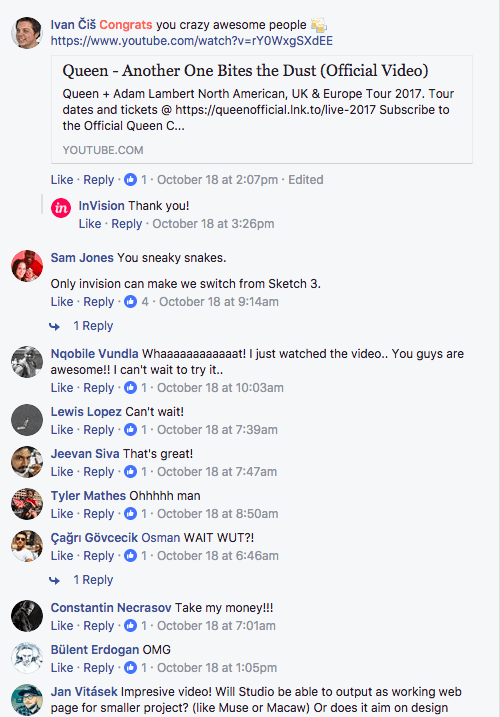 A look at the comments below shows just how compelling a simple pre-launch post can be on social media. The best part is the social proof that comes along with something as public as Facebook. Each comment acts as a mini review for InVision, attracting users that may be unsure or unfamiliar with their product. https://www.facebook.com/invisionapp/posts/849565658533321This is where InVision started to differentiate themselves from traditional product launches. Many businesses and startups would have only gone as far as the initial announcement. InVision recognized that they had an opportunity to develop in-person relationships with key stakeholders. It also gave the InVision team the opportunity to see, first-hand, exactly how the product performed in real time. Are users enjoying the product? Is it intuitive? Do they find it useful? Do they have feedback? According to a CB Insights survey, 42% of startups fail because of poor product-market fit. What better way to get an early sense for product-market fit than to see users in action, as early on as possible? 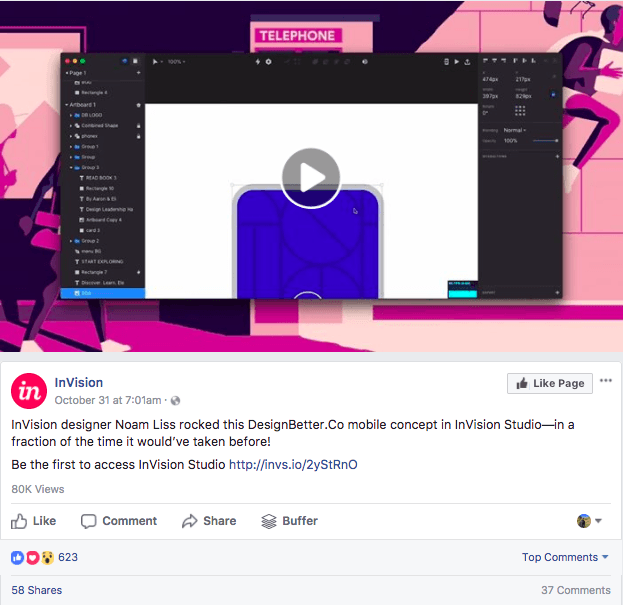 Thirteen days after InVision’s initial announcement on Facebook came a live look at a real user showcasing the product with a strong CTA to “Be the first to access InVision Studio”. InVision closed the gap between what people imagined Studio could do and what it actually can do. That human connection and experience is often what’s missing in so many product launch communications. InVision shifted the focus from talking about the product features to demonstrating the benefits. The video now has more than 80,000 views on Facebook, with that number climbing by the day. The ability to target specific, qualified users is arguably the most powerful aspect of social media as a marketing channel. Facebook and Instagram, in particular, offer enticing avenues to reach customers for the obvious reason of reach (the two social networks combine to reach nearly one-third of the Earth’s population). But also these networks offer brands an incredible wealth of data in the form of audience demographics, segmentation options and conversion numbers. For example, let’s say that your product’s target market is women aged 45-55, who own a home, work in technology and live in the United States. You can use social media targeting to reach this exact audience! 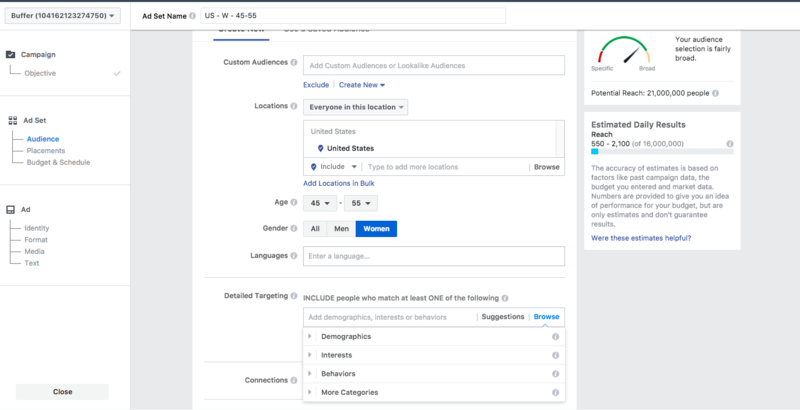 Our team at Buffer has created a complete guide to Facebook advertising if you’re interested in sharpening your expertise. 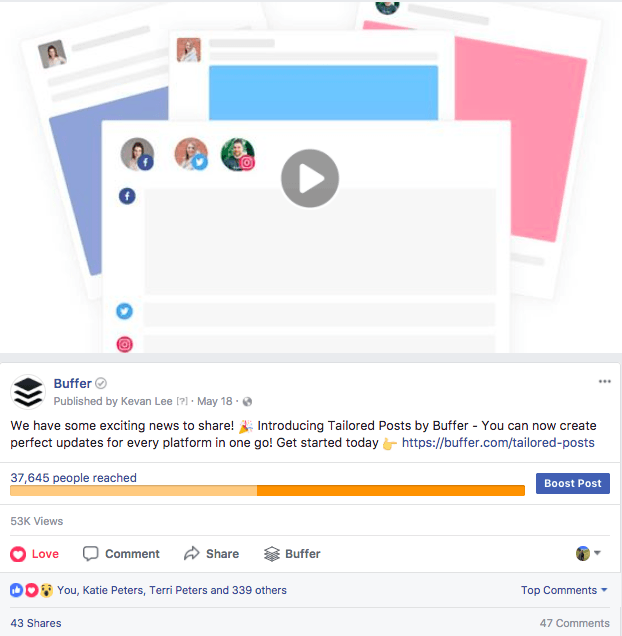 Recently, I had the opportunity to witness Facebook’s powerful targeting capabilities in our launch of Tailored Posts. On launch day, we posted the video below organically to Facebook. After 24 hours, we set up a Custom Audience within Ads Manager, targeting visitors to our blog within the last 60 days. 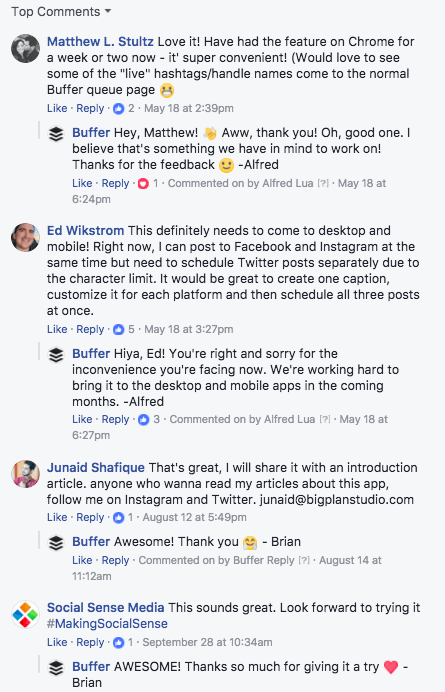 We then excluded traffic to buffer.com to help ensure that people who saw the post were non-Buffer customers. Finally, we spent $100 to boost this post to our newly created Custom Audience. In just 48 hours, the boosted post had driven more than 1,200 clicks to our product landing page and more than 53,000 unique views to the video (73% were more than 10-second views!). Honing in on many of the audience targeting features available within Facebook, Instagram and other platforms will help to get your product in front of the people who are most likely to convert into a customer. We’ve seen a dramatic shift over the last few years on social media. What used to be a one-to-many channel for marketing is now becoming a place for brands to connect one-on-one with their audience. Social media is a place to listen, connect, converse, and engage with people. When it comes to product launches, social media is no longer a megaphone. It’s a place to listen, connect, converse, and engage with people. A place to build long-lasting relationships – relationships with users that will eventually do the product marketing for you. Therefore, every conversation matters. 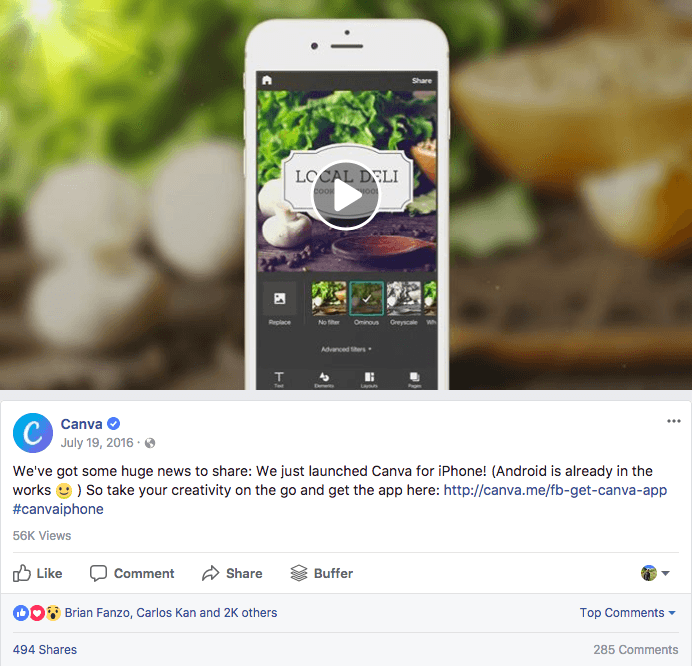 When Canva launched Canva for iPhone in 2016, they received more than 450 comments from their users on Facebook alone. Their team made sure to respond to every question, comment, piece of feedback, complaint and compliment. Doing so played a significant role in the momentum of the product campaign’s reach and awareness. As your product launch campaign gains traction, the amount of conversations will naturally increase. This is the perfect opportunity for you to jump in and engage with these active audience members. Each person you take the time to interact with is an opportunity to create a loyal fan that will eventually do the marketing for you. https://twitter.com/netflix/status/580479298458488832In our Tailored Posts launch (example above), we took the opportunity to connect with each customer that reached out to us. A one-to-one connection becomes even more important when the questions or concerns relate to the product itself. Showing empathy towards users and publicly responding to feedback will help to alleviate any concerns they might have. Think about all of the times you’ve looked at negative reviews about products or businesses – a direct response from the company can make a world of difference. Treat each one of your fans as customers. Social media plays a defining role in the customer service and engagement strategies of many brands. There’s never been a better time to exceed customers’ expectations and delight them every step of the way. If you’re in the process of preparing for an upcoming product launch or are simply looking for some creative product ideas, I highly recommend putting social media at the top of your marketing checklist. The ability to build product hype, target specific users and engage with potential customers make social media an invaluable and powerful tool in every businesses’ toolkit. Be persistent, post high quality content on a consistent basis, treat each one of your fans as customers and utilize all of the wonderful data that social media provides. You’ll be well on your way to a successful product launch.